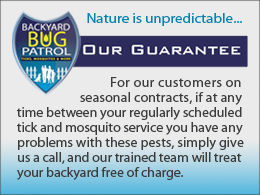 Backyard Bug Patrol is the leader in professional mosquito control and eradication throughout Virginia, Maryland, West Virginia and Washington, DC. We make your backyard livable. No more annoying mosquitos buzzing and biting. No itchy welts and scratching. No bug zappers or mosquito swatters. No more Deet laced mosquito repellant that you slather on… Deet is losing its effectiveness anyway. And no potential diseases like West Nile Virus or Eastern Equine Encephalitis or Heartworm in pets. We take back your yard and can help protect your family and pets from these pests. With the purchase of one of our packages, our licensed applicator will come to your home and barrier spray your yard. Our programs below not only knock mosquitos dead on contact but our backpack sprayers get deep into the foliage in your yard and coat leaves, bushes and grass leaving a protective barrier that repels these pests. With regular backyard sprays you can control mosquitos. Call us today to discuss options and pricing. We can provide protection from mosquitos for the entire season or can custom tailor a program just for you. Backyard Bug Patrol offers the safest, most effective way to rid your yard of these disease carrying mosquito pests. 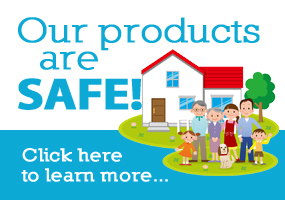 We offer two proven mosquito killing solutions. 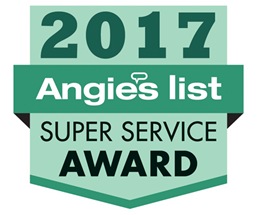 In addition, we believe that we have the best customer service in the pest control industry and offer a 100% guarantee to our customers on seasonal contracts. Don’t forget your wedding or other special event. We can make sure that unwanted guests don’t show up for the party. We also treat public pools, municipalities and other commercial properties for mosquitos. Mosquitos are responsible for more human deaths than any other living creature. Ever year mosquitos cause more than a million deaths worldwide. They are a threat to public health not only all over the planet but especially here in the Metro DC area too. In the US, mosquitos cause West Nile Virus, Heart Worm in dogs and Eastern Equine Encephalitis, not to mention a few cases each year of Malaria and Dengue Fever. There are over 150 different mosquitos in the US. 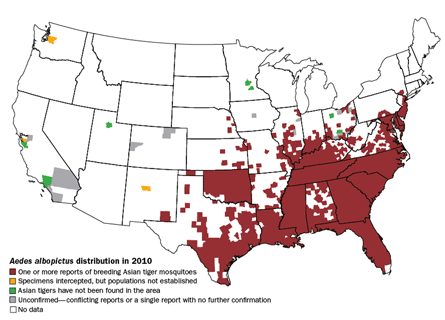 Most generally stay within 1 to 3 miles of where they were born with the Asian Tiger Mosquito not going more than 300 yards from its birth place. To lay eggs, the female mosquito needs a blood meal. After biting you, she doesn’t actually eat the blood she uses the blood protein to develop her eggs. What mosquitos eat is the the glucose found in plants. So when they aren’t busy sucking your blood, they generally hang out under leaves and other foliage feeding on plants. That’s where we come in. Backyard Bug Patrol uses backpack sprayers to treat your yard. They look a lot like the leaf blowers that the lawn maintenance guys use. Our spray will kill mosquitoes on contact and will put up an invisible barrier that will last up to three weeks. Mosquitoes need water to lay their eggs. But it’s interesting to note that the water doesn’t need to be fresh water, they can lay their eggs in salt marshes and brackish pools. One mosquito can be responsible for one billion offspring (assuming they all survive) in one month! So, removal of standing water on your property is crucial and is an important part of preventing mosquitos. It’s always a great idea to implement a prevention program in conjunction with any spray. Mosquitoes develop from egg to adult in 4-7 days. Adults live for 4 to 8 weeks. Most mosquitoes feed heavily at dawn and at dusk. During the heat of the day most mosquitos rest in a cool place on the underside of leaves and wait for the evenings, although they may still bite if disturbed. 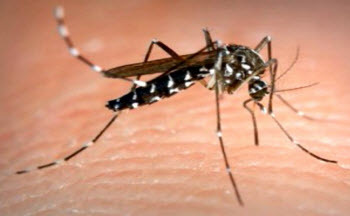 Some species, like the Asian Tiger Mosquito are known to fly and feed during daytime. Carbon Dioxide attracts mosquitoes from as far away as 35 feet. Also, it seems that dark clothing attracts them more than light colored clothing; and interestingly enough, people drinking beer attract mosquitoes greater than not. The West Nile Virus (WNV) is transmitted by mosquitoes. Shockingly, in 2010 almost 10% of all deaths in the United States from West Nile Virus occurred in VA, MD and DC. WNV is cycled between birds and mosquitoes and transmitted to mammals and humans by infected mosquitoes. Symptoms of WNV include fever, headache and fatigue with aches or a rash. Similar to the flu. It can last a few days or a few weeks. WNV first showed up in the US in 1999. Since then it has traveled across the country. According to the American Mosquito Control Association, as of 2010, there have been 30,491 cases of WNV reported to the Center for Disease Control (CDC). Of these, 12650 have resulted in meningitis/encephalitis, and 1196 were fatal. CDC estimates that there have been at least 1.5 million infections (82% are asymptomatic) and 341,000 cases of West Nile Fever, but the disease is grossly under-reported due to its similarity to other viral infections and lack of knowledge regarding protection. Not just for dogs, Heartworm is transmitted by mosquitoes and can also affect cats too. In either case it can be deadly for your pet. Spread by mosquitoes to both people and horses, Eastern Equine Encephalitis can affect the central nervous system and can cause severe complications and even death. Survivors can be left brain damaged. Women are usually more attractive to mosquitoes than men because of the difference in hormones produced by the sexes. Blondes tend to be more attractive to mosquitos than brunettes. Smelly feet are attractive to mosquitos as is Limburger Cheese.